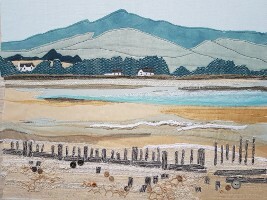 I am a self taught textile artist based in Mid Devon. I have combined a love of art and sewing to produce individual pieces of textile art inspired by nature and the countryside. I specialise in free motion machine embroidery to produce my work, adding hand embroidery, beads and buttons where appropriate. I regularly source second hand fabrics and lace to use in my work which helps to give my work a unique feel. I have made a conscious decision to work with fabrics just as I find them, so I don’t dye fabrics or incorporate paint into my work at all. I really enjoy the challenge that this brings. My product range includes greeting cards, small gifts, Giclee prints and original pieces of textile art.